Dr. Dulay graduated from the Boston University Henry Goldman School of Dental Medicine. Dr. Dulay is licensed to practice dentistry in the State of Florida and the Commonwealth of Massachusetts. She had additional training in the fields of Cosmetic Dentistry, IV sedation, Orthodontics and Oral Surgery. 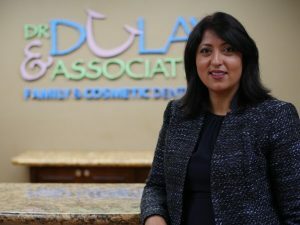 Dr. Dulay continues to educate herself by taking courses and training in various fields of dentistry, which allows her to stay abreast of the latest dental techniques while continually refining her skills. Dr. Dulay and her Team are committed to providing quality healthcare to our patients. We treat patients of all ages and provide comprehensive solutions for each patients’ dental healthcare. We believe in the importance of listening to our patients; therefore, we take the time to truly understand each person’s needs, goals, and lifestyle. By understanding each of our patients’ objectives we can provide solutions that will improve their dental healthcare while transforming their smile into something bright and beautiful. Very friendly and helpful staff. Loved the extended hours. Very informative dentist. I highly recommend. Dr. Dulay's staff is courteous and pleasant. That eliminates all the anxiety while going to a dentist's office. The service is incredibly good. My experience has always been pleasant. I recommend Dr. Dulay to any and all.